Link Church was formed in 1980 by a group of people who had a desire to be part of a church expressiing our lives together in genuine friendship in serving God in our families, communities and around the world. We initially met in people's homes and then a variety of community centres before, in 1997, we moved to our current building in Priory Lane, Dunfermline. Our church is in fellowship with Assemblies of God in Great Britain. We are a member of the Evangelical Alliance. Our community groups meet in various homes in the Dunfermline area on Tuesday and Wednesday evenings. Our weekly prayer meeting takes place in Priory Lane on Tuesday evenings at 7.30pm. We have a number of houses around our local communities where people meet regularly to pray for their neighbours, local community, schools, local services, businesses, wider area, personal situations. Some of the houses of prayer meet weekly and others less regularly and some may meet for an hour and some for longer. It is not about everyone doing the same thing but rather that we are increasingly in prayer to seek Gods best for those around us. A group of toddlers and their big people meet at the Toddler Group on Thursday mornings in Priory Lane at 10 am so the little ones can play, do crafts, sing and have a snack, while the grown ups enjoy a chance to relax and chat to one another. This group is free of charge and everyone is welcome! Messy Church is a once a month time for families to get together for a time of creativity, music and eating together. Messy Church @ The Link will be back on Saturday 27th April. Duloch Messy Church will be back on Saturday 11th May. Once a month we have Breakfast Church in Priory Lane. 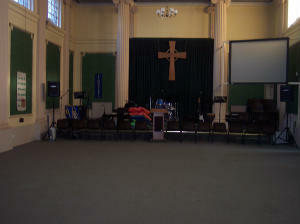 We meet at 9.45 am to have breakfast together and then we have an informal time of worship which starts around 10.30 am. Everyone is welcome and there's no charge! The next Breakfast Church will be on Sunday 19th May.